All our sessions at Whispering Spirit Ranch offer individual change and growth in many areas of a person's life, regardless of the age or challenges. 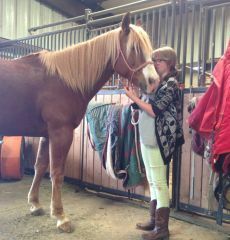 Here, the common denominator is fostering and nutruting that change and growth through the marvelous ability of a horse to touch a participant's life in a powerful, profound, and meaningful way. The learning and mastery of a new (horsemanship) skill enhances patients' confidence in their ability to tackle new projects, such as recovery, and leads to improved self-esteem.